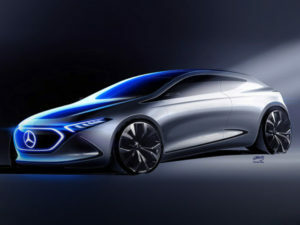 Revealed prior to its debut at next week’s Frankfurt Motor Show, the concept builds on Mercedes’ announcement last year that it will launch an entire family of electric vehicles under its EQ sub-brand, as well as parent firm Daimler’s plans to more than 10 new electric cars into series production by 2022, from the Smart to the large SUV. The three-door hatchback – which previews possible design features for future EQ models –follows last year’s reveal at Paris of the Generation EQ concept, which uses a scalable platform designed for electric models and enabling deployment across the full Mercedes-Benz car line-up. Last year saw parent firm Daimler AG file trade marks for EQA, EQB, EQC, EQR, EQS, EQV and EQX with the UK’s Intellectual Property Office, as well as the Concept EQ name, hinting at the segments EQ could operate in. Mercedes has also said the EQ brand will encompass charging services, wallboxes and even home energy storage in the future. This year’s Frankfurt will also see smart reveal its smart vision EQ fortwo concept, which shows the carmaker’s ideas for how electric and autonomous technology could unite in the future to bring an urban car sharing solution.